Definition and description of the Jongleurs: The Jongleurs can be described as a court attendant or other person such as a traveller who, for hire, recited or sang verses and performed other acts for the entertainment of the audience including thet of a conjuror or a juggler. Jongleur is the French word for juggler. Often the Jongleurs role was to assist the Troubadours or Minstrels. 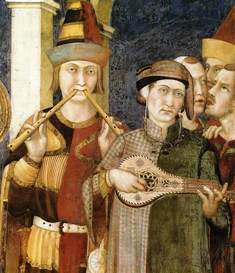 The Jongleurs were often collaborators or assistants of Medieval Troubadours or Minstrels. Jongleurs gained a reputation of itinerant entertainers of Medieval France and in Norman England where many were deemed to be vagabonds and untrustworthy. Their repertoire included extravagant skills in dancing, conjuring, acrobatics, and juggling. The Jongleurs also played a part in singing, and storytelling. Many were skilled in playing musical instruments, although their skills were not greatly recognised or rewarded. I can play the lute, vielle, pipe, bagpipe, panpipes, harp, fiddle, guittern, symphoy, psaltery, orginistrum, organ, tabor and the rote. I can sing a song well, and make tales to please young ladies, and can play the gallant for them if necessary. I can throw knives into the air and catch them without cutting my fingers. I can jump rope most extraordinary and amusing. I can balance chairs, and make tables dance. I can somersault, and walk doing a handstand. Refer to the Medieval Music index for facts and information about all of the above Medieval musical instruments. The Jongleurs gained a reputation of itinerant entertainers of the Medieval times in France and Norman England. Another type of performer of even lower rank than the Jongleurs were the gleemen, a travelling entertainer. In time the Jongleurs disappeared. Their reputations were such that they were replaced by the Minstrels who also suffered from a similar stigma. In 1469 a charter of King Edward IV ordered all minstrels to join a Guild. It was called the Guild of Royal Minstrels. Medieval Minstrels were required to either join the guild or to stop being minstrels. The travelling musicians of the Medieval era with their colorful lifestyle were eventually replaced by the court musicians, jesters and entertainers. The Waits became popular and extended their roles into becoming town musicians. 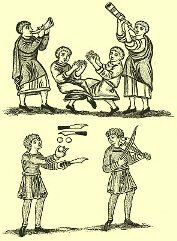 The Medieval Times website provides interesting facts, history and information about the musicians and styles of music which scatter the history books including the Jongleurs. The Medieval Life and Times Sitemap provides full details of all of the information and facts about the fascinating subject of the lives of the people who lived during the historical period of the Middle Ages. The content of this article on Jongleurs provides free educational details, facts and information for reference and research for schools, colleges and homework for history courses and history coursework.